Hanoi (VNA) – The Office of the National Assembly (NA) and the Hanns Seidel Foundation of Germany co-organised a workshop in Hanoi on April 25 to seek solutions to air pollution. The event was designed to provide more information for NA deputies while debating the country’s socio-economic development and making important decisions related to the environmental and climate change. Deputy Head of the NA Office Do Manh Hung, who chaired the event, reiterated the World Health Organisation’s warnings about Vietnam’s air pollution compared with Asian and Pacific nations, saying that Vietnam has more than a half of the days in a year with poor air conditions. Studies conducted by the Institute of Strategy and Policy on Natural Resources and Environment (ISPONRE) under the Ministry of Natural Resources and Environment, showed that air pollution is mainly caused by transport, industrial production, construction, daily activities, agriculture, trade village and waste treatment. According to the Ministry of Health, Vietnam has recorded the highest increase of respiratory diseases, largely caused by air pollution. Air pollution is also a major cause of global issues, including ozone layer depletion, atmosphere warming, and acid accumulation. 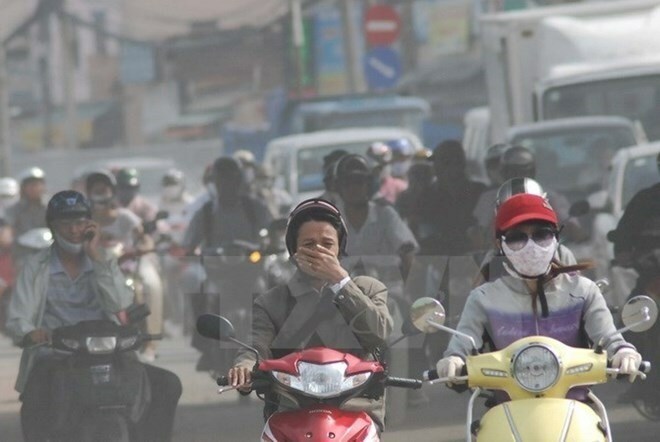 Nguyen Van Thuy, Director of the Centre for Environmental Monitoring under the General Department of Environment, said Hanoi and Ho Chi Minh City’s air is the most polluted due to socio-economic development activities. Other industrial provinces, such as Quang Ninh, Thai Nguyen and Dong Nai are suffering from air pollution. ISPONRE Deputy Director Nguyen Trung Thang suggested that relevant legal documents should be revised in line with the reality, particularly in urban areas, industrial zones, and trade villages. Management should be tightened in the sectors that are likely to cause air pollution, such as transport, construction, trade villages, and waste treatment, Thang said, adding that mechanisms are needed to reduce gas emissions while offering incentives for technological application to reduce air pollution. Participants urged for the prompt promulgation of a law to control air pollution with specific regulations and ensure enforcement of the law, specifying responsibilities and obligations of stakeholders, particularly state management agencies.